Your Christmas Tree is probably the centerpiece of this wondrous season's decorating. It's where our gifts lie waiting for their eager recipient. It's a gathering place for loved ones, the backdrop for many prized photographs, and a warm and happy remembrance, often for a lifetime. That is why we at Alexander's Tree Farm strive to offer you a large selection of quality trees and adornments, along with a cheerful attitude and whatever help you may need. 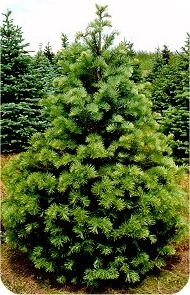 Douglas Fir - These soft needles are dark green - blue green in color and are approximately 1" in length. This tree has needles that radiate in all directions from the branch, outstanding needle retention, and a lush full shape . They are one of the top major Christmas tree species in the U.S., and a long standing favorite here on our farm. 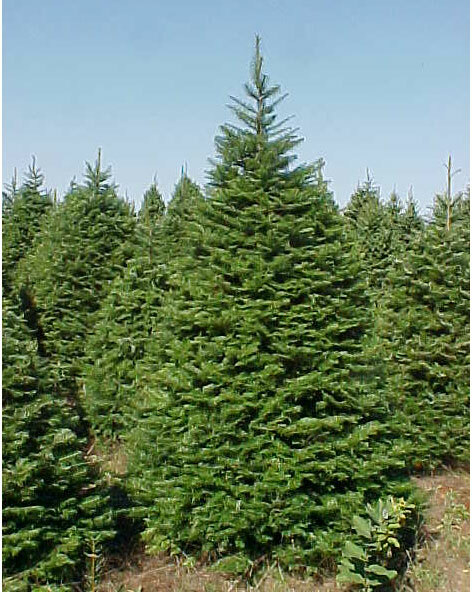 Fraser Fir - The Fraser fir branches are sturdy and turn slightly upward, with emerald green, stiff 3/4" needles. They have good form and outstanding needle-retention. They have a pleasant scent, and excellent shipping characteristics as well. Canaan Fir - These needles are 3/4" - 1" in length and last a very long time. Very similar to Balsam and Fraser, these trees have a dark-green appearance, a full lush shape, and will retain their pleasing fragrance throughout the Christmas season. 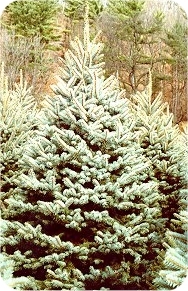 Concolor Fir - These silvery blue, soft needles are around 2 - 3 in. in length and occur in rows. This tree has excellent needle retention, a full and fluffy shape, and a pleasing citrus aroma. 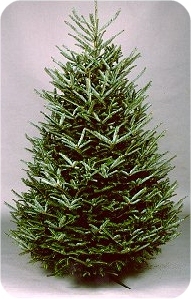 Grand Fir - These soft needles are emerald green and 2-3" in length. This tree has glossy foliage, a very full shape, and outstanding needle retention. 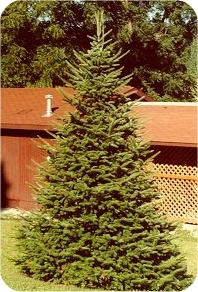 Colorado Blue Spruce - Often used for stuffing pine-pillows, these sharp needles are 3/4 - 1 in. in length. This species is dark green to indigo blue in color. 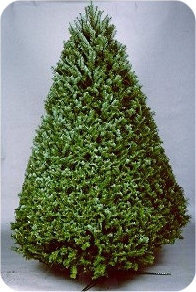 This Christmas Tree has good symmetrical form and has an attractive blue foliage. It also has good needle retention. 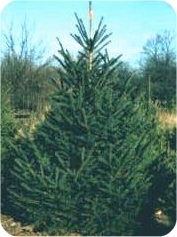 White Spruce - The White Spruce is excellent for ornaments; it's short, stiff needles are 1/2 - 3/4 in. long and have a blunt tip, and are bluish-green - green in color. They have excellent foliage color and have a good, natural shape. The needle retention is better in a White Spruce than it is among other spruces. Our trees range in size from 4 ft. to 12 ft. This year we are offering a bargain—any tree in the field, regardless of size--$37.99. You can choose and cut or we'll cut it and haul it to the barn for you, at no extra charge, or choose from our fresh pre-cut selection. Every Spring we plant more than 3 times the number of trees taken from the farm! Please feel free to ask questions about any of our trees.